Owning a house is a never-ending adventure in investing your heart and soul into a wholly unique structure. Some homeowners have great big budgets for massive changes or enhancements to their home, others are working with a shoestring. If you’re in the second group, you can still put your mark on your house. There are plenty of ways to personalize it without spending a lot of money. After the stress of moving is over and the dust has settled, you may start to ponder other ways to enhance your new home. When you moved in, it was pretty generic, with cream-colored walls, light brown carpet and an outside paint job that absolutely no one could find offensive. A lot of houses end up in this generic state when the owner is wanting a fast sale, but that doesn’t mean it has to stay that way! Replace the front door. According to Remodeling Magazine’s 2018 Cost Versus Value Report, replacing your front door is one of the most value-packed changes you can make to your home. A new door not only creates a new focal point, it allows you to really get personal. These days you can special order doors in nearly any size with exquisite touches like frosted or stained glass, as well as bigger units that have full size windows on either side. Remodeling Magazine ranked front door replacement third in cost recuperation; the best value return on the list was also a door. Consider your garage door while you’re upgrading. Like front doors, garage doors are becoming increasingly detailed, with lots of options for personalization. Because they take up so much real estate on the front of your house, a new garage door can make your home look completely different. Choose a paint scheme with more than two colors. That’s not to say that you should go wild and paint your house in every color of the rainbow, but by using at least three colors, you can draw attention to the neat little details instead of letting them get lost in a monotone trim color. For example, if your post-World War two era home has neat porch brackets and dentils, you might paint those features to match the front door so they pop out from the trim. Just don’t go crazy with color or the effect will be lost in the cacophony. Add shutters and window boxes. On the right house, shutters or window boxes can pack a huge visual wallop. Choose shutters that are appropriate for the style of your home, even if you need to special order them. You can keep them seriously low-maintenance by selecting vinyl shutters in the color you’re after — just hang them and forget it. The same goes for window boxes. Low maintenance boxes with colorful flowers can help perk up plain windows. Relight the night. Details matter and that includes your lighting. Get rid of those generic carriage lights and clunky motion detecting flood lights and install some impressive lighting on the outside of your home. There are lots of styles to choose between, many with motion detection built-in, and several sizes. Lighting that fits in the space appropriately, provides lots of light and matches your home’s outer theme is an important element in a total shoestring makeover. Raise some flower beds. Growing plants on your lawn can become a messy proposition as the summer’s heat starts to bear down. Built-up beds are easier to maintain than patches in the grass and they lend a bit of formality to the space. Choose a location that makes sense, like along a walkway or up against the porch so visitors are greeted with your cheery plants. It doesn’t take a huge budget to make changes to the outward appearance of your home. Planning colors and accessories strategically makes all the difference, especially when you’re on a limited budget. Not Sure You’re Ready for Painting or Installing Fixtures? Not everyone is handy or inclined to find out if they can paint by doing it, and that’s ok, too. These inexpensive projects can be tackled by a home pro easily. Just log in to HomeKeepr to find a painter, electrician, landscaper or general handyman that your Realtor has already recommended! Your house will be refreshed and renewed in no time. 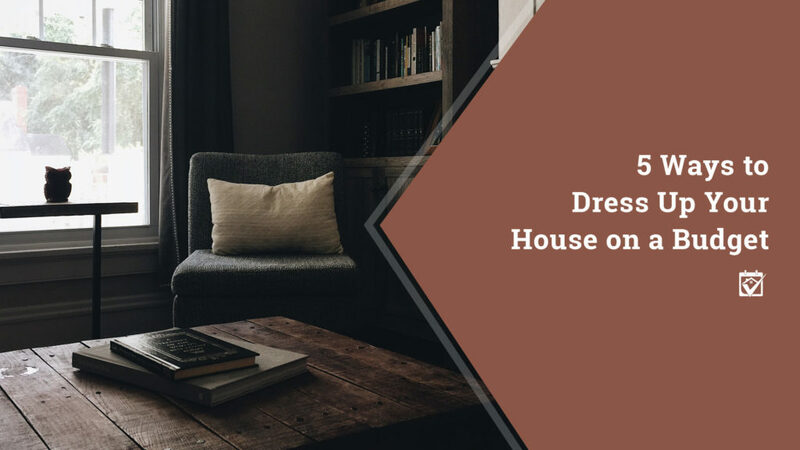 The post 5 Ways to Dress Up Your House on a Budget appeared first on HomeKeepr.